This unusual family home has a simple, modern exterior that would blend easily into most chic suburbs. The colour scheme is based on a cool grey colour palette, the L-shaped facade is very common and the peaked roof has a classic appeal. But the interior is decidedly different. Nowoczesny dom LIV 3 G2—przytulnie i pięknie! The home may take the shape of a classic family home, but the finishes are decidedly modern. 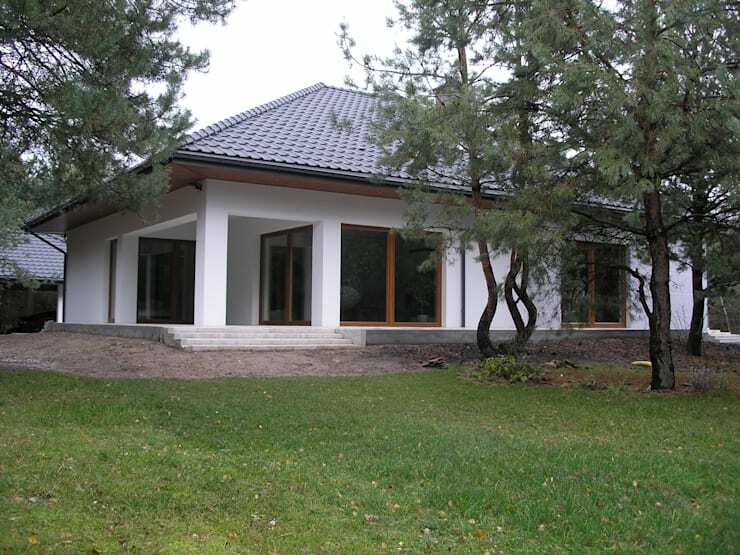 The windows and doors are completely free of ornamentation or flourish and the surfaces have a very raw, modern feel. They are composed of a mixture of cool grey panels, a dark grey roof, two-toned stone pavers and white walls. But the home also has a natural, grounded ambience. 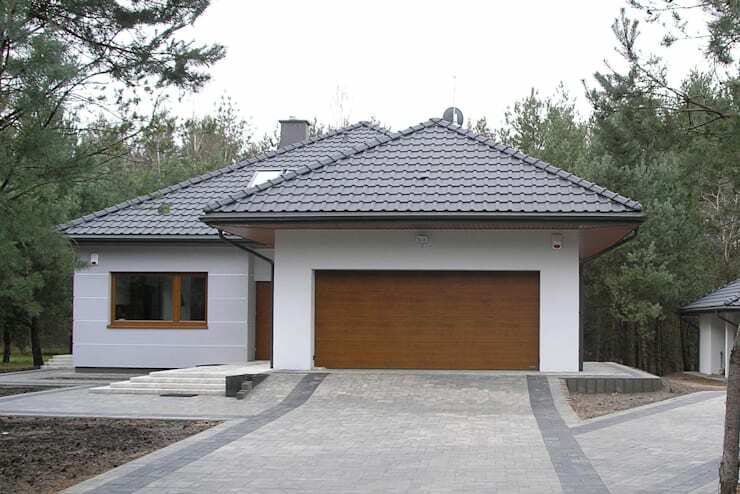 Wooden doors create a subtle, yet warm link to the natural forest surroundings. At the rear of the home, we find a large shaded outdoor area. The site has a slight incline and the home has been set on a slightly raised platform. The garden is accessed by a series of shallow steps that give the home a low-key modern appeal. But the most dominant features here are the large floor-to-ceiling windows and sliding doors. They create a direct link to the surrounding scenery and allow lots of light to flood the interior. Note how the large openings have been confined to the back of the home and mostly recessed behind the porch. This allows the occupants to retain maximum privacy. It's hard to believe this interior belongs to the exterior we have just explored. 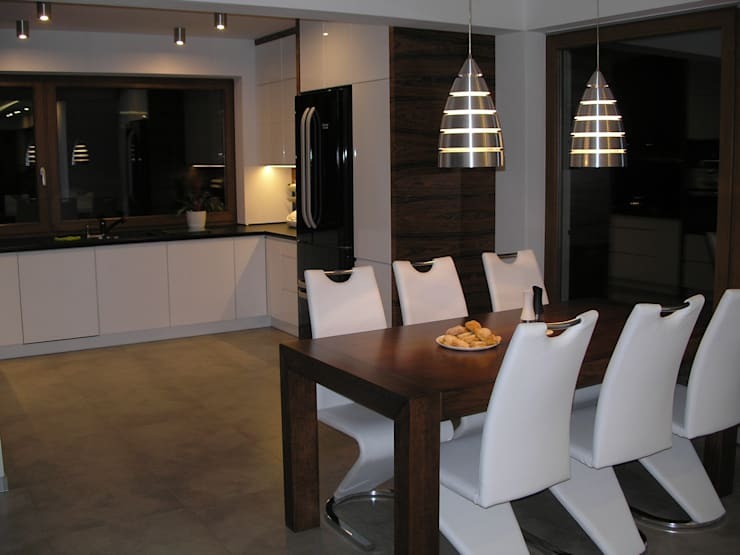 The monochrome colour scheme and neutral palette are still present, but the lighting fixtures are definitely different! The main light that hangs from the ceiling has an almost 1960s flair. 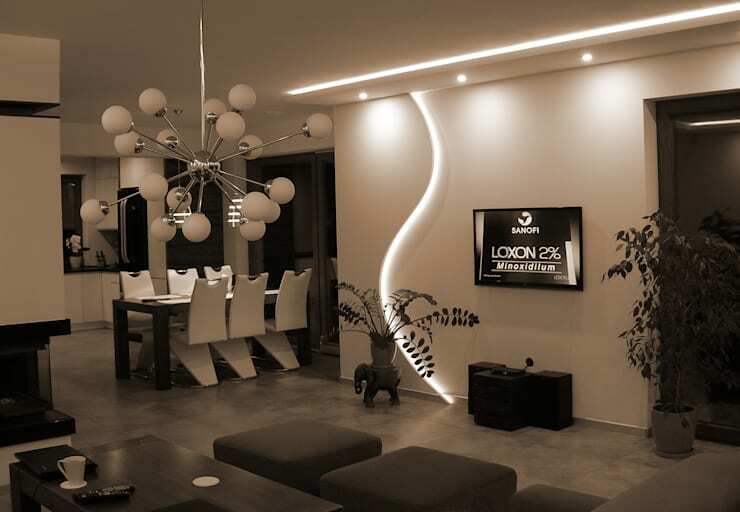 The cool and curvy lighting theme is continued in the unusual curved recessed light in the wall. A series of downlights and a fine ceiling light add the final creative flair. In this picture we have another view of the ceiling light that illuminates the monochrome living room. 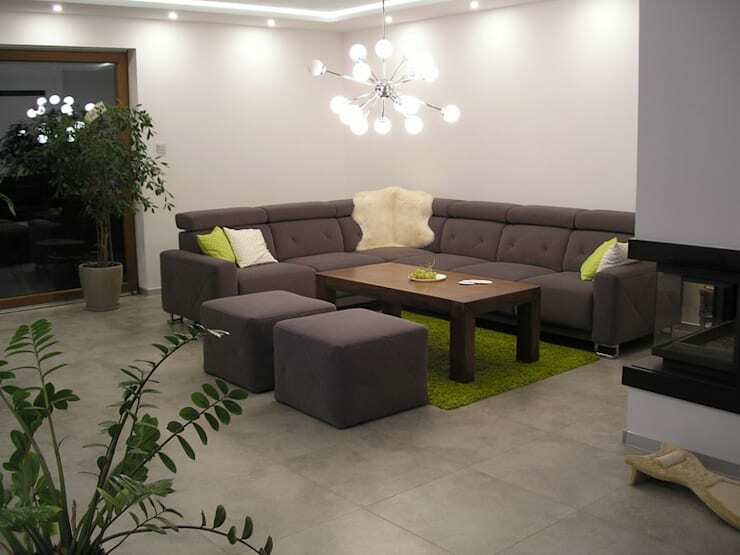 The floor is made of polished concrete, the large modular sofa is grey and the white walls are bare. These elements lay the base for a living room with a minimalist feel. But the unusual light fitting and the bright green accent colours really add that extra bit of life to the room. The green rug and pillows would really highlight the relationship to the garden greenery during the light of day. A black and white scheme always looks good when teamed with metallic finishes. Here in the dining room, metallics have been introduced in the form of these modernist style pendant lights. They highlight the unusual chrome backs of the modern white dining chairs and give the dining room that extra bit of flair. After some more contemporary interiors? Then you'll love A modernist palace in rich cream. What do you think of the unusual contrast between internal and exterior spaces in this home? Let us know in the comments field below!